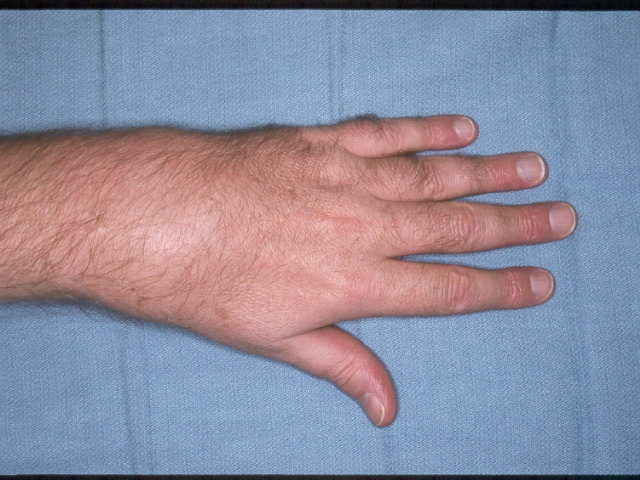 Synovitis on the extensor surface of the wrist may involve several areas in close proximity: the extensor tendons and the radiocarpal or intercarpal joints. In some cases, all areas are involved. The most common form of dorsal wrist synovitis is the dorsal wrist ganglion, which most often arises from the scapholunate joint. 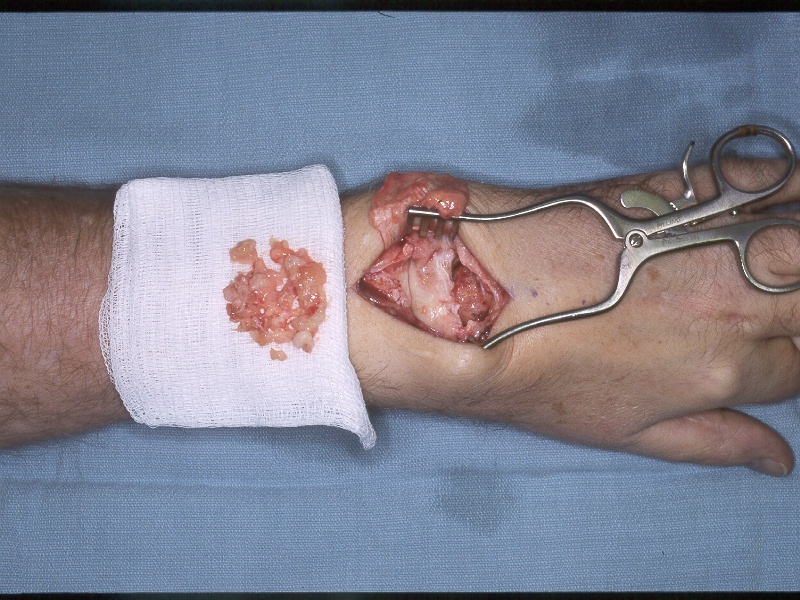 The most successful open treatment of a dorsal wrist ganglion includes cyst excision and synovectomy of the source joint. 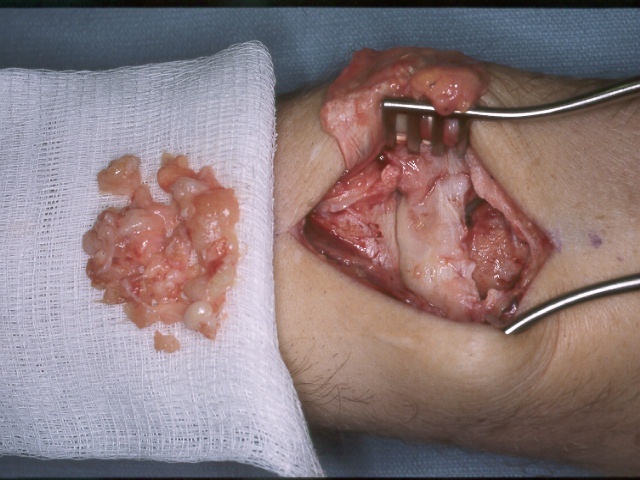 Less commonly, dorsal wrist synovitis is a diffuse proliferative process which requires thorough extensor tendon and wrist joint debridement. This is an example of such an approach. 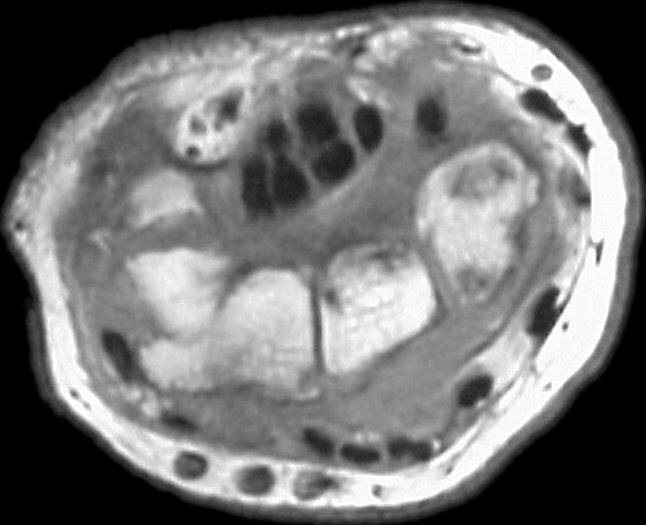 This gentleman presented with minimally painful progressive swelling of the dorsal wrist, with no prior history of injury. 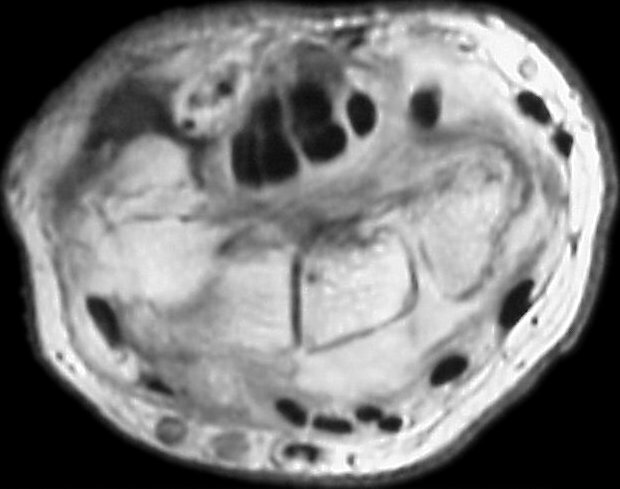 MRI revealed poorly defined soft tissue prominence deep to the extensor tendons and small cystic carpal changes. 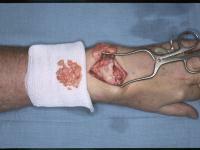 The mass was vascular, with no fluid filled spaces or other evidence of a typical dorsal wrist ganglion. 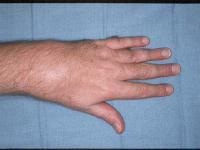 The patient's sedimentation rate was mildly elevated, but rheumatoid factor and antinuclear antibody tests were normal. At exploration, inflammatory tissue was found encasing the extensor tendons, and appeared to arise from the entire dorsal wrist capsule. Pathology was inconclusive, but suggestive of a rheumatoid process. All cultures were negative, including bacterial, fungal, and mycobacterial studies. He was believed to have a seronegative rheumatoid process, and has been managed further by a medical rheumatology specialist.